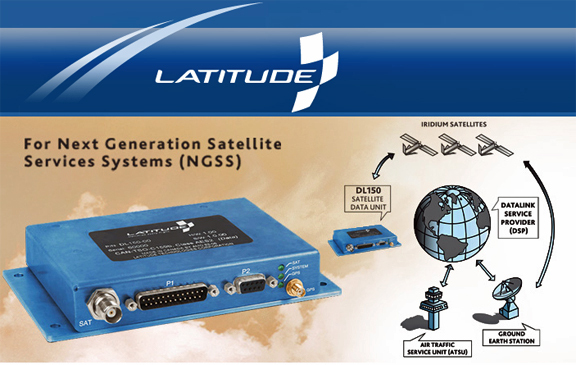 [Satnews] Latitude Technologies will be introducing and taking orders for the company's newest Iridium satellite network data communications device—the DL150 SDU (Satellite Data Unit). The company will also be showcasing the Latitude's complete product family at the NBAA 2015 Business Aviation Convention & Exhibition, November 17-19, in Las Vegas, at Booth # C-7830. The DL150 SDU is targeted to business and commercial jet operators who are looking for a lightweight, multi-function, cost affordable datalink device to complete their FANS 1/A+ installation. Qualification is currently underway for TSO-C159b, DO-262B, DO-178C Level D, and DO-160G for Next Generation Satellite Systems (NGSS). The DL150 supports ATS notification, ACARS and CPDLC messaging, and ARINC-741 and ARINC-618 protocols. The DL150 also supports optional flight-tracking and 3-axis acceleration monitoring. The unit has discrete inputs and outputs for optional event reporting. Duncan Aviation is building the first STC for Latitude’s DL150 SDU (Satellite Data Unit). The DL150 STC will be added to Duncan’s Challenger 601 FANS 1/A+ STC program.